শুধু জাসদেরই ৩০,০০০ এর বেশি নেতা-কর্মীকে হত্যা করা হয়েছিলো বলে দাবি করেছিলেন দলীয় নেতৃবৃন্দ যারা আজ সাথীদের রক্তের সাথে বেঈমানি করে হাসিনার নৌকোয় উঠে নির্বাচনী বৈতরণী পার করে হয়েছেন আওয়ামীলীগের মন্ত্রী! মুক্তিযুদ্ধের শুরু থেকে শেষঅব্দি যত মুক্তিযোদ্ধা শহীদ হননি তার চেয়ে বেশি মুক্তিযোদ্ধাকে শহীদ করা হয়েছে স্বাধীন বাংলাদেশে। এ ধরনের হত্যাযজ্ঞের জন্য দায়ী ব্যক্তিদের মরণোত্তর বিচার দাবি করা কি ন্যায়সঙ্গত নয়? এর দায়ভার কি করে এড়াতে পারেন মুজিব, জিয়া, এরশাদ, খালেদা, শেখ হাসিনা এবং তাদের সহযোগীরা যারা বিগত ৪৫ বছরের উপর রাষ্ট্রীয় ক্ষমতা উপভোগ করে আসছেন? সেনা পরিষদের মধ্যমণি জেনারেল জিয়াকে ৭ই নভেম্বরের পর পুনরায় সেনাপ্রধান হিসাবে ক্ষমতার কেন্দ্রে পুনঃপ্রতিষ্ঠিত করার পর আশ্চর্যজনক ভাবে স্বয়ং জেনারেল জিয়া ও তার দোসররা জোর প্রচারণা চালাতে লাগলেন দেশে-বিদেশে যে ১৫ই আগস্ট এবং ৭ই নভেম্বরের যুগান্তকারী বৈপ্লবিক অভ্যুথানের মূল চালিকা শক্তি গোপন সংগঠন সেনা পরিষদ, বিপ্লবী সৈনিক সংস্থা এবং বিপ্লবীদের সাথে তার কোনও সম্পর্কই ছিল না। তাই যদি হয় তবে ১৯৭৯ সালের নির্বাচনে বিপুল ভোটে বিজয়ী হয়ে তিনি ও তার দল রাষ্ট্রপতি মোশতাকের জারিকৃত ‘Indemnity Ordinance’ টিকে ‘Indemnity Act’ এ রূপান্তরিত করে ৫ম সংশোধনীর অংশ হিসাবে দুই তৃতীয়াংশের বেশি ভোটে নির্বাচিত সংসদে পাস করিয়ে সাংবিধানিক বৈধতা দিতে বাধ্য হয়েছিলেন কোন যুক্তিতে? At the Bangkok Airpot we Bangladesh Ambassador along with staffs and officials of Thai Foreign Ministry were in waiting to wel come us. From the Airport we were taken under tight security to International Hotel in Sukumbhit where our stay was arranged by the Bangladesh Embassy. Everything found over and above Thai Bhat 200 for each person was sanctioned by the Bangladesh government to us as pocket expences. Not bad in those days. Both Bhabies after spending some time returned back with the same Aircraft. As a patriot and freedom fighter how could you betray the national cause just to become the Chief? What do you think I am here just to become the Chief? If that would not be the case then why Zia was forced a blank paper? Khaled Bhai could not reply. 4th November Brig. Khaled demanded to the President to dismiss Gen. Zia and appoint him as the Army Chief. President Khandakar Mushtaq refused and left Banga Bhaban after resiging and went to his home at Agamosi Lane. Simultaniously Banga Bir Gen. Osmani and Gen. Khalilur Rahman also resigned from their posts. This created a Constitutional crisis and Khaled issued an Ordinance and appointed Justice Sayem as the President and announced himself as the self appointed Chief of Army Staff. There after Brig. Khaled forced his appointed President Justice Sayem to promulgate an ordinance aborogating the Constitution, Cabinet and Parliament. Through the same Ordinance Martial Law was declared through out the country. Thus the President became the Chief Martial Law Administrator and the free Chiefs of Staffs of Army, Airforce and Navy became the Deputy Martial Law Administrators to rule the country. The next day all the print and electronic Media carried this promulgation. The people became apprehensive at such outrageous pronouncement! Why the President Mushtaq, Banga Bir Gen. Osmani, Gen. Khalil had to resign under durace? Why Gen. Zia has been kept under house arrest? Why the leaders of August Revolution had to leave the country after marathon negotiation with Brig. Khaled and gong? After abrogating the Constitution by which law Brig. Khaled had nominated Justice Sayem as the President President and became the self declared Chief of Army Staff? The victory March under the leadership of Brig. Khaled’s mother and his brother BAKSHAL leader Rashed Musharroff indicates what? Brig. Khaled and his followers as the pawns of India is up to reinstall one party dictatorial BAKSHAK regime back into power? The patriotic armed forces along with the people have to rise to stage another armed revolution once again against the vicious design of Brig. Khaled for the greater interest of the country, is there any other option left? Will the vast majority of the people practicing different religion once again accept the persecution due to their religious beliefs? Due to distribution of this Leaflet, covert contacts of the leaders of Sena Parisad and Biplobi Shainik Shangstha with different segments of the society and on going realities the people, officers and soldiers of the armed forces were getting clear answers of those questions. So, hearts of every patriot everywhere was fuming in avorance against the Indian sponsored nefarious design of Khaled clique. Thus gradually peoples sentiment started going against Brig. Khaled Musharrof. At that point of time the leaders of Sena Parisad and Biplobi Shoinik Shangstha started to have exchange views with like minded leaders of political parties, organizations and civil society to finalize the action plan. The leaders of Khaled clique was unaware of what was going on in different Cantonments at that time as all of them in Banga Bhaban were then intoxicated with the smell of power. On 5th November Gen. Khaled as the new Chief issued an order for the deployed forces and the tanks at the strategic position in the city to fall back to Dhaka Cantonment. This order was a blessing in disguise for the revolutionaries who had been planning the up coming revolutionary uprisinf of 7th November. 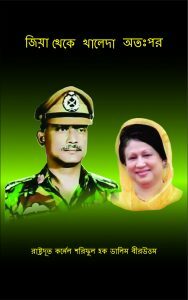 Meanwhile on the 4th Nov being over enthusiastic Gen. Khaled’s mother and brother Rashed Musharrof a BAKSHALITE Leader organized and headed a procession with Mujib’s potraite and other banners and festoons chanting such slogans as ‘Banga Bandhu Hottyar Bichar Chai’, ‘ Jail Hottyar Bichar Chai’, ‘Joy Bhanga Bondhu Joy Bangla’ etc. seeing the pictures of this procession published in the front pages of all the dailies next day the countrymen were sheet scared and apprehensive. In their eyes both this procession and the putch of Brig. Khaled and Co against President Khandakar Mushtaq became synonymous. Everyone got convinced that the reactionary putch of Brig. Khaled and Co was a nefarious design of India to reinstall autocratic BAKSHAL Regime back to power again. Brig. Khaled was identified as to be an Indian pawn. Thus Brig. Khaled-Col. Shafayet Jamil & Co lost all credibility and acceptance to the people. Mother, you all have finished me, I shall not be alive any longer! Gen. Zia is tactfully doing dillidaling to implement the action programe of Sena Parisad which is questionable. They also opined that if Gen. Zia is replaced by Brig. Khaled then it would be easier to implement our action plan expedeciously through him. Their views was not considered reasonable by the majority leaders present. Therefore, the decision was taken that keeping Zia as the Army Chief he would be cautioned to rectify his failings and short comings. As their views were not carried they became irrational and had fallen into trap inistigated by Brig. Khaled and Col. Shafayet Jamil to participate in a reactionary Putch against Gen. zia on 2nd November by miss leading some troops of 1 and 4 East Bengal Regiments under their command with false propaganda. With out their support it would not have been never possible for Brig. Khaled and Col. Shafayet to undertake such untowards move. After 5th November those miss guided troops realised their mistake and sided with Sena Parishad once again. Thereafter, khaled and co realised that their position at Dhaka has become untenable. Fathoming the grave situation self proclaimed Genarel and Chief of Army Staff Khaled requested his childhood friend Col. Huda(Gudu Bhai) then GOC Rangpur to dispatch 10 and 15 East Bengal Regiments to Dhaka. On order Col. Nawajish the CO of 10 East Bengal Regiment along with his Battalion arrived from Bogra and was placed in the Gana Bhaban. After hrearing the news of Brig. Khaled’s take over over enthusiastic Col. Jafar Imam, CO of 15 East Bengal Regiment dashed to Dhaka to give his eligence to Brig. Khaled. He was ordered to bring his Battalion to Dhaka. Receiving the order from the GOC he rushed back to his Regiment at Rangpur. There he had to face the wrath of the angry soldiers. Finding the hostile enraged Battalion he deserted and fled to his village at Noyakhali to hide. He was so scared that he did not have the courage on his way even to inform his GOC or Gen. Khaled at Banga Bhaban to inform them about his miserable plight. The uprising will start at mid night 12 o’clock on 6-7th November. The uprising will be conducted from 2nd FD Regiment under command of Maj. Mohiuddin. At 12 O’ clock mid night a tracer shell would be fired from a gun on order of Maj. Mohiuddin in the sky as a signal to star the uprising by all the units under Sena Parisad in Dhaka Cantonment. Col. Taher took the responsibility to organize people’s support in the city from a secrete hide out. The aim of the uprising would be to oust Gen. Khaled and co from power and reinstall Gen. Zia, the chosen Army Chief to his post and there after he would be requesting Khandakar Mushtaq Ahmed to resume his responsibility as the President again. During and after the success of the uprising every patriotic member of the armed forces should be prepared to lead a people’s war agaist any Indian intervention. After the success of the up rising the leaders of Sena Parisad who left the country for tactical reason would be brought back forth with. All these decisions were intimated to all concerned as well as to the leaders of every cell of the units in all the Cantonments.